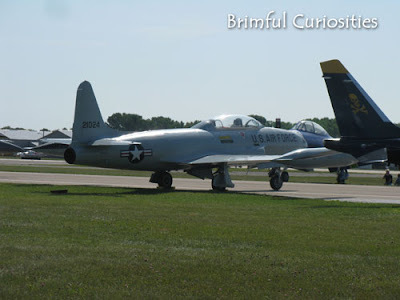 A few pictures from the EAA AirVenture 2009 (Experimental Aircraft Association) in Oshkosh, WI, last Wednesday. My husband went with his father. We'll take the kids to AirVenture when they get a little older. I love the jet fighter pic, how cool to have worked on that! You must live not too far from me. We really enjoy going to EAA. My husband spent 4 days there last week. I went out of town this year as the jets were too loud last year for my son...but will probably try him again next year as he loves the rest of it. He loves all the planes going over the house heading in. 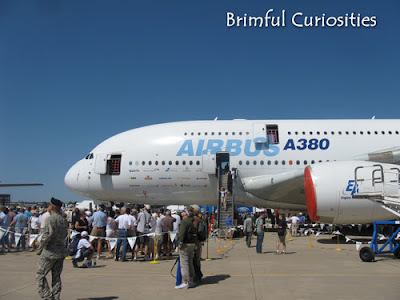 We got to see the huge airbus going over last Tuesday. Looks like fun! The kids will love it when they get bigger. Wow, that looks like fun! So neat! Cool photos! I've never been to the EAA but when we lived in Beaver Dam I remember we used to have a ton of traffic come through town when that event was going on. We talked about taking the kids up there but never did. Great pictures! I'll bet he has some cool stories to tell! My son would LOVE to go there... we have been to tons of different events but never to EAA before..
That huge plane makes me feel a little panicky!! LOL! Great to look at from the ground. LOL I'd rather drive. I've heard EAA is great! We'll have to head up there when the kids are a bit older.